I get out the door quite late this morning, despite the fact I set my alarm for 6 am. My husband was cleaning out his work van over the weekend, and needed my help backing out of our very narrow (built in 1941) driveway so he could get to work. There are literally inches between the van and the house and the fence on the other side with the big mirrors pulled in. So it does take a bit of maneuvering to back it out of the driveway. As I ride the Red Line this morning, I take some notes to tell you about the different stations. Each one is slightly different in the materials used for the floor, column dressings, and seating. The most colorful station is the one just north of the Cahuenga Pass at Universal City. The entire station is done in vibrant mexican style tiles. Some tiles are huge. They are images of historical people, and they tell a story. Along the track in the Hollywood and Vine station, the poured concrete walls have molded into their design, a continuous old style sprocketed film strip, painted a muted azure blue. 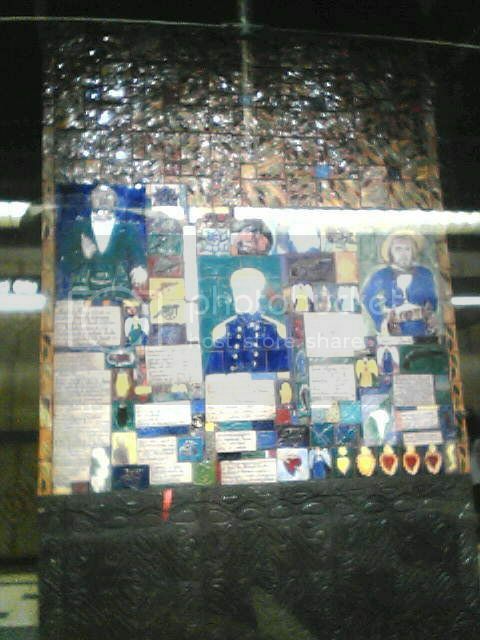 At the Hollywood and Western station, the support columns are covered in maze of multicolored six inch square tiles. Even the designs and patterns in the floors using various materials are different at each stop. 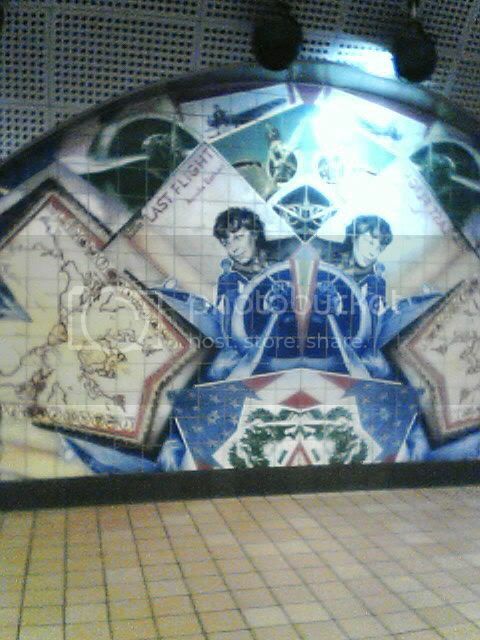 The North Hollywood station has the most interesting displays of local history done in tile on the walls of the kiosk area, such as this tile mural of Amelia Earhart. However, to me the station is spoiled by huge, floor to ceiling McDonald’s advertising. surrounding the columns in the shape of huge carpenters biscuits. 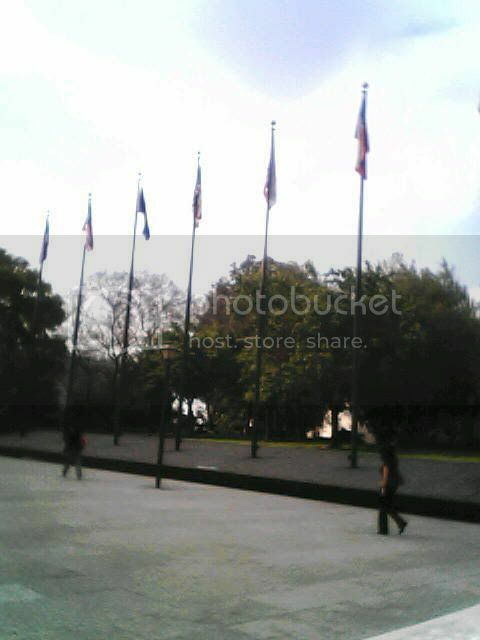 As I pass through the Court of Flags plaza today, I take the time to count how many flags are there. There are 19 poles, but one flag is missing. The Liberty Tree Flag from 1775. As I approach the rear of the court building, I can tell I am very late because there are no cameramen waiting on the railing. As I pass through the 9th floor security and round the corner, virtually no one is in the hallway. Everyone is inside already. It’s now that I realize that court must start at 9:30 am instead of 10 like I had assumed. The prosecution’s male clerk leaves the courtroom and I ask him if there are any public seats left. He doesn’t know. When I try the door it is locked, but the deputy just inside opens it. There is a suited woman beside me, being somewhat forceful with the deputy claiming to be a defense attorney and wanting to “just look inside” the courtroom. As he’s deciding how to respond to her, I politely ask the deputy if there are any public seats left. He says there is one seat left. My hope is rising. The deputy lets me inside, pointing to the seat I can take. The Judge is already on the bench speaking to the jury. The courtroom is packed today with almost a third more media/public than there was last Thursday. Lots of new faces that I had never seen before. The Judge is talking to the jury about the 48 Hours show that aired on Saturday, and that the prosecutor in that case (about the execution style killing of Mickey Thompson and his wife) was Alan Jackson. Judge: Did anyone happen to see it? There’s no response from the jury. Judge: Well, so much for their ratings. Small amount of laughter erupts from the courtroom. The judge then instructs the jury that they are in recess until Wednesday, explaining again that court would be closed tomorrow due to the demonstrations that would be occurring in downtown LA. I’m trying to find out what’s wrong. Why no testimony today? The jury exits the courtroom, filing back into the jury room. One of the massive bodyguards in the row of seats against the wall behind me sees that I have a note pad and motions and points to my pad, asking for a sheet of paper. I’m thinking I better give him one. He hands it to the slender man beside him who starts to write something down. There is a matter before the court. It has to do with two defense witnesses who appear to have spoken with the media about this case. The two witnesses are Dr. Wecht and Dr. Lee. In Dr. Lee’s case, there is some question as to whether or not he did, but in Wecht’s case, there is no question that he did. The Judge says, “I’m ordering all parties to notify their witnesses not to discuss the case.” And the Judge goes onto talk about sanctions by the court if they don’t comply. Mr. Jackson then brings up a motion (motions?) that he is filing under seal, (from the public) and it appears the defense either has an objection to that or some other concern about it, or maybe their own motion filings and can they file under seal. The Judge indicated that it can be filed under seal, but he will make the final determination as to whether or not it remains under seal. It will stay under seal until he reviews it. I finally dawns on me why there’s no testimony. At the defense table, there’s no Bruce Cutler. Why is he missing? Is it like the Blake case, and there was a family emergency or death? Is this some sort of tactic that mob lawyers usually pull? The sheriff’s call out for everyone in the gallery to remain seated, and the jury emerges from the jury room, and files past everyone for the front door to exit the courtroom. I hear some mumbling that Wednesday may also be a no court day also, if Cutler is still out. After the jury leaves, and the judge finally leaves the bench, everyone starts gathering their things and filing out. Since I’m standing right at the door, waiting for those beside me to get up so I can exit also, Dominick Dunne walks by. He sees me and gives me a smile and a hello. Outside the courtroom, I finally get a full on look at Alan Jackson up close when he emerges from the courtroom. Many of the poster’s comments here are accurate. He is handsome. As he passes, a reporter asks him if the public liaisons office will know if court might be delayed again on Wednesday. Alan tells him that he doesn't know. Check with the court. The reporters are all waiting outside for the rest of Spector’s defense team to emerge, because they're hoping they will find out what’s wrong with Cutler. Several of the reporters speculate. One wonders if he got tennis elbow at the polo lounge. Steven is advising a new reporter on the restaurants close by where he can get a decent lunch, and is also trying to remember if Cutler ever mentioned (in his book I’m assuming) a health issue. Nothing is coming to his mind except possibly high blood pressure. As he heads for the elevators I imagine he will be doing a lot of research trying to see if he can find something out. Spector emerges from the courtroom. He is wearing another one of those calf length long coats, with his hands clasped in front of him. He is supported at the elbow on his left by his wife, Rachelle Short and on the other by a bodyguard who tells us to “watch out” so that they can pass, clearing the way. As he is led, Spector stares, zombie like, straight ahead. The reporters are shuffling about, almost like all the air has been let out of their balloons. Everyone is looking at everyone else, and I can visualize everyone wondering, what story am I going to be forced to work on today? (For me, it will be laundry and gardening.) I listen while the AP reporter and a handsome reporter I’ve never seen before, talk about the “lesser included” charges. (I later find out this is Joe Dominick.) Could the jury settle on one of those? From something that I read here on the forum, I was under the impression that the Judge had already ruled that the state was limited to second degree murder. So, I say, “No.” But at the same time, the AP reporter is nodding her head saying yes. I shut up. I’m thinking I probably don’t know what I’m talking about. The handsome reporter wonders if it could actually be involuntary manslaughter, and the AP reporter says, that there are several attorney’s around town that believe that should be the charge. As I head toward the exit, Dawna says hello to me, and it’s then that I recognize her. Over the weekend she got virtually all her hair cut off and is sporting a very new look. She looks so different with a short, almost pixie type haircut. I repeat to Dawna what I overheard the AP reporter say, and my thought that the only charge allowed was the second degree charge. Didn’t the Judge rule on that? Dawna says, “Today?” I reply, “No. In earlier rulings.” She’s puzzled, because she doesn’t think the Judge made a ruling like I think he did. She seemed to think though, that the AP reporter would really know the case. Dawna points out to me the famous writer Joe Dominick, who wrote that great piece in Los Angeles Magazine, and we ride down on the elevator with him. Dawna and I tell Joe about how limited the Court TV coverage is, (they often repeat the same scene, over and over) and there’s actually more on Court TV Extra, available online. But even that coverave isn't everything that goes on at trial. When we reach the first floor, we say our good-byes until Wednesday. I finally take the time to use the stairs down to the Red Line. Consequently, I miss a train by about 5 seconds and have to wait about 15 minutes for the next one. I hope you enjoyed my trial notes for today. Please understand that my notes should not be used in place of a more exact transcript of the trial. Although I tried to be as accurate as possible when I was quoting someone, I’m sure you will find some statements that do not exactly match Court TV’s Extra coverage. I should just face reality. I have a hard time getting out the front door when I want to. There’s always “one last thing” I want to try to get done, and consequently, I get started later than I really wanted. I had hoped to leave the house by 7:30am, (and get downtown an hour later) but my hair still wasn’t dry, and I hadn’t packed my lunch or found my pair of red suede moc’s I’d been saving. It’s always something. My ride on the Orange Line was almost exactly like the first experience in February, except I was struggling getting all my change out of the ticket kiosk, (it does take a bit of time to pick up 17 one dollar coins) while the bus driver waited patiently for me to get my change and board. This bus had video feeds, and I was looking forward to seeing something interesting, but for most of the trip, all it showed was a map and where the bus was on the map. And as the bus went a few blocks, so did the little bus image on the map. This is supposed to entertain us? The landscaping along the Orange Line is more visually appealing than the video, and for the first time, I noticed how the vegetation is much more developed at the eastern end of the line, since it was completed first. Woah! The bus just swayed real hard; the driver took the curve around Fulton Ave. really fast. I think he was going over 50mph! For the rest of the trip, I squint to try to watch his speedometer. on Hill Street, half way between First and Temple. From the Court of Flags, you can see across the Criminal court parking lot to what appears to me to be one of the older court buildings. I’m embarrassed that I don’t know which building this is, but I thought you would enjoy an image of it. 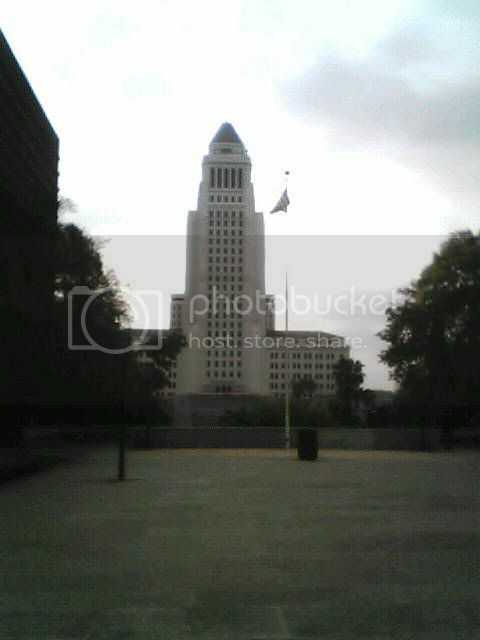 (I find out later this is City Hall.) 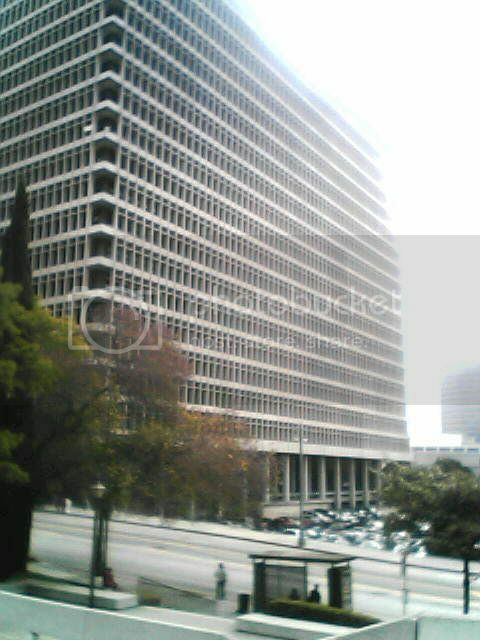 I’ve seriously thought of bringing my good camera downtown, but I would have nowhere to store it if, for some reason, the sheriff's decided not to let me bring it past the security checkpoints. 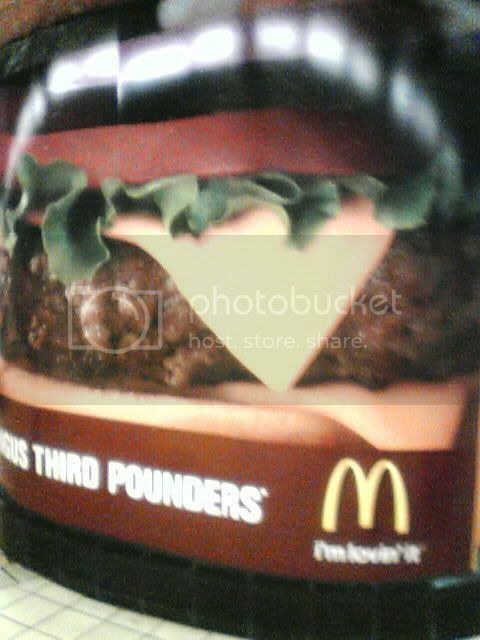 So for now, I’m reluctantly settling for the grainy images from my old cell phone. As I pass through the Court of Flags plaza and reach Broadway, the back of the Clara Shortridge Foltz Criminal Justice Center comes fully into view. I can see a group of photographers about seven in all, on the railing overlooking the parking lot waiting for Phil to arrive. You can barely see them in this photo. And, in the west corner of the lot, a lone photographer with a tripod and long range lens. Across the deep set lot I can see Spring street, which is where Court TV has set up their filming area for Beth Karas’s on air commentary. Through pm’s warhorse46 said I should go over to the taping area, and introduce myself to Beth. When I did, she was just about to go on air, and did not have time to talk. 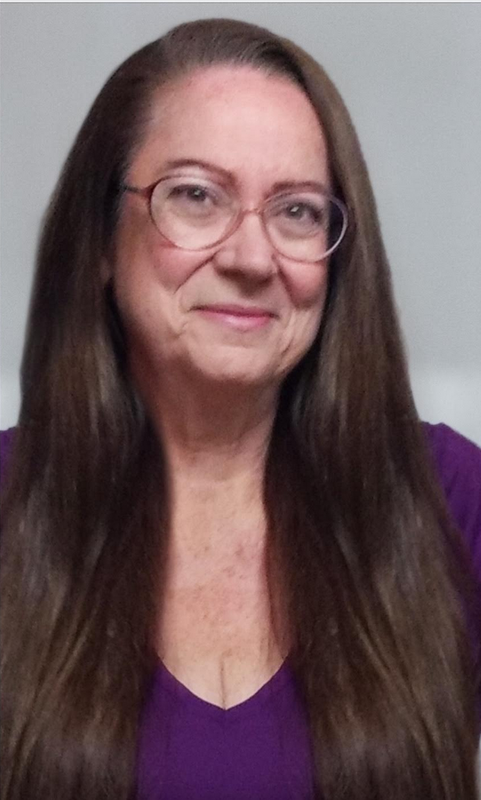 I just had enough time to mention that I had met her briefly before at the Robert Blake trial, and that I was friends with Linda Sweetingham (a former print reporter for CourtTV) .....Beth said, “You mean Lisa...” Oh boy. “I’m sorry! Yes, I meant Lisa.” I must have turned beet red in the face. You see, I was so nervous I totally misspoke Lisa's first name. Although you might not guess it from my post on various crime forums, I’m actually a very shy, introverted type person. I have a difficult time introducing myself to total strangers and carrying on a conversation. I will often trip over my own words. You will never see me on camera, being interviewed like Marlene Newell (sp?) was at the Scott Peterson trial. I would be so nervous, I would probably look and sound like a total idiot, lol! As I arrive on the 9th floor and pass through the second security checkpoint, I see a mass of reporters waiting for Judge Fidler’s courtroom to open. I see Russ, an on-air reporter for a news organization I got to know during the Blake trial. I also recognized the reporter who covered the Blake trial for the LA Weekly, Steve Mikulan, and reintroduced myself. If LA Weekly News (Online) has his stories, I encourage you to stop by and check them out. He wrote some great articles covering the Blake case, and I’m sure he will have a witty, insightful take on this case, too. As I lean against a wall to wait, Steve is in the process of editing a story he’s already printed out, and I mention to him that he has a very unusual way he holds his pen. It’s one of the things I notice when I meet people and see them write is their handedness. I’m always on the lookout for other lefties like myself. We talk a bit about the different ways people hold their pens. Steve mentioned that it was a madhouse at the courthouse yesterday, and I know that I probably would not have been able to get in to observe. Steve mentions that Cutler only spoke for 45 minutes yesterday, and will continue with his closing today. He also mentions that the rules of this courtroom are much more strict than at the Van Nuys Courthouse. The reporters won’t be able to go in or out whenever they need to file stories. Steve says that if you leave, you won’t be allowed back in. That the sheriff's don’t even want the reporters to leave at the morning and afternoon breaks. And I'm thinking, I better go pee when I can. I also see that the famous AP reporter Linda Deutsch is already there as well as Dominick Dunne. As some might know, I’m a big fan of Mr. Dunne. I’ve read several of his novels, and his diary is the first thing I read when my Vanity Fair arrives in the mail. Phil’s main defense attorney arrives and talks to Dominick for a bit. After he steps away, I get the courage up to approach Mr. Dunne, and reintroduce myself to him, mentioning that I met him at the Blake trial, and that he signed one of his books for me then. I ask him if in the coming weeks, he could autograph another one of his books for me, and he assured me that he would. I’m ecstatic that I even got my courage up to speak to him. After scanning the crowd and not seeing Alan Parachini. from the court’s Public Relations office, I finally see their representative, a young woman carrying the numbered badges they give to the reporters who have registered and checked in for a seat to cover this trial. She says that once the deadline has passed for reporters to check in, she’ll see how many seats are left. At this point, she feels I have a good opportunity to get in to observe. My day is looking even better. Three tall and enormously wide individuals come out of the courtroom and pass me in the hall. They are massive human beings. I remember hearing on TV that Phil surrounded himself with huge bodyguards because he is such a small person. These guys are not just big, I mean they are really big. What goes through my mind though, is the thought that, being next to these men really amplifies the impression people get of Phil being a small man. I think this is intentional. Sandi Gibbons, the District Attorney’s public relations officer arrives soon after I get a seat in the back row of benches on the left side. There is an empty space next to Russ, and it’s nice to sit next to a familiar face, where I can occasionally feel comfortable asking a question or two. I have a good full view of the jurors, the judge and the witness stand. I can barely see Phil through the crowd of reporters though. The Court TV control camera is in the far left corner at the end of the second bench isle from the back. There are two men sitting very close together in swivel chairs hunched over this control screen. Behind them are two lens cameramen with compact cameras that can zoom in on the defense and prosecution tables, as well as the judge and witness box. (Later, at the morning break, I find out that the men holding the cameras have been standing that entire time, and will do so all through out the day.) Eric Leonard from KFI is sitting in the row in front of me, and notices me for the first time. He smiles and says hello. Court comes into session. There is a discovery issue that must be discussed before the jury can be brought in. This is regarding evidence collection that Dr. Henry Lee did on behalf of the defense on February 4, 2003. The issue is over three years old and still has not been resolved. After requesting it numerous times, last October, Dr. Lee finally turned over a blood sample that he collected during his time in the house. However, it wasn’t until April 20, that the prosecution actually received the “55 photographs” he took, that actually puts that evidence into context. The prosecution has requested these photographs for at least two years. This is a blatant discovery violation by the defense Mr. Jackson contends. Jackson says they haven’t had time to do any real analysis on this yet. My question is, was it Dr. Lee who stalled in getting this sample and images to the defense? Or, did the defense attorneys stall in turning this discovery item over to the prosecution, because, supposedly it is the prosecution’s evidence. I don’t particularly understand that specific point of law, but the judge said that the evidence is clearly the prosecution’s. Judge Fidler: You still haven’t answered why did you turn it over so late. Judge Fidler: Where were the photos? Why late? Judge Fidler: (The defense has) ...no firm leg to stand on. There’s one other issue. (It appears) Mr. Brunon KNOWS one of the jurors. Holy carp! How did that happen? From what I’m gathering, it appears Mr. Brunon was not in court for all of the voi dire. One of the jurors used to work for the building management, where Mr. Brunon had an office location. Mr. Brunon says he knows the jurors first name, but at this time can’t remember his last name. He just knows he’s sitting somewhere near the left edge of the jury box. Since he can’t remember his last name and is not sure of his juror number, the judge decides to bring out the entire jury. The judge explains to the jury that Mr. Brunon was not here for (the entire?) voi dire. The Judge then describes something about a case People vs Cruse (spelling?) and he says a case number that I didn’t get the complete number (224.350? ), and that Justice Krouse (spelling?) answers all the defense questions. I’m not sure what this refers to; it might be this particular issue. The Judge then jokingly says something to Mr. Brunon about plastic cups would be provided for water for you, but then you will be billed for them by the court building. This must be in reference to something else that has happened prior. The Judge says the jurors are numbered 1-9 at the top from right to left and the right front row as numbers 10-12 and then the alternates. Mr. Brunon says the jurors number (of the individual he knows) and the judge asks him to stand. The juror is asked if he knows Mr. Brunon, and he replies that he does; that he used to work for the building where Mr. Brunon has/had an office. The judge asks about the nature of their relationship, and did he feel that knowing Mr. Brunon would affect his ability to be impartial. The juror said it would not, and so he is still on the jury. Cutler now goes into the differences in the size of the “decedent” and Phil Spector. Cutler never mentions Lana’s name. And I can tell that this is on purpose. It’s to depersonalize her. She was 5 feet 11 inches and 160 pounds. Phil is 5 feet 4 inches and 130 pounds. Lana was drinking alcohol and pills.....what did that have on her judgment? “Take it into context.” Cutler mentions the Carlyle Hotel Incident: “You’ll see from evidence in New York...unlike California they don’t look to a woman if you have a gun. You have to have a carry permit.” (This is down right misleading. Of course we have carry permits here in California, too.) He didn’t, and he wasn’t. She was given train fare. The hotel room was all paid for by Phil.” He mentions something during this section on the Carlyle Incident about her “not” being a prostitute, and that “The ladies all continued to see Philip.” Cutler goes onto say that this woman took photos she had of Phil and sold her story to the National Enquirer. “Bear in mind, DeSouza is not a witness to what happened inside the house. He was in the Brazilian army. Keep all this in mind, when evaluating evidence.” Cutler goes onto talk about the prior incidents and makes a point to say that “no one prosecuted Phil. No one sued. All saw him afterwards.” And then Cutler says several times something (to me) that is amazing. He repeats it. “What Mr. Jackson said is not evidence.” Well, what you are saying is not evidence either Cutler lol! He looks like a mob lawyer, and is somewhat dramatic. I’m getting bored with this guy now, and I look around for Mr. Dunne in the courtroom. Baden says that science may even tell you that she (Lana) loaded the gun herself. That the government ignored the science. Phil did not hold the gun. He did not pull the trigger. He wasn’t close enough. She says they (PD) “used circular reasoning...” Her ten points included, location of the bullet wound, and she went into detail about the unique attributes of an “intra oral wound,” and that they are “classically self inflicted.” “The bullet graised the tongue.” “You do not swallow a gun like that unless you do it to yourself.” She went into great detail on the path that the police went in their investigation and how they went off track by at first thinking that Phil shoved the gun in her mouth in front of her teeth, but that proved to not be the case. She states that science will show that her mouth was around the barrel of the gun, her lips resting loosely on the barrel. There was no damage to the outside of her mouth. And, the fact that her front teeth (dental caps) were propelled forward and not inward, down the throat substantiates this. She went onto say that the "...path of the bullet wound entry is consistent with a self inflicted gun shot wound.....path slightly upward.” She points out that the decedent was sitting on a low chair, only 15 inches off the ground. (As I type this, I actually take the time to measure the folding chair I sit on at my computer desk. The top of the cushion rests at 16 inches and the top edge of my dining room chair cushion rests at 18 inches.) “She was seated low.... the trajectory of the bullet was slightly upward....” I look on over at the jury. They seem alert; attentive. I notice several of the alternates in the front row nearest me taking notes. Baden mentions a few famous forensic pathologists. Dr. Vincent Miao and his book Gunshot Wounds, and later, Dr. Lee and his book, and also mention’s Dr. Werner Spitz. And I think, so Lee is actually going to testify? After that horrendous job he did at the Michael Peterson trial? Sheesh! It appears that, according to these experts, the blood spatter from an intra oral wound can supposedly be projected out much farther than the prosecution has let the jurors to believe in their opening statement. Baden apologizes at this point for appearing callous. “Intra oral wounds are not your normal gunshot wounds. There is a difference where there is no exit wound. ... The gasses of the gun are huge and enormous. ... There is no forward spatter and they (the blood) go back out. ...The mouth/head becomes like a chipmunk." And she demonstrates for the jurors by puffing her cheeks out. It’s now that we get our morning break, and I finally get to stretch and go to the restroom. I don’t want to be stuck in that courtroom needing to pee, and once leaving, not be able to be let back in by the deputy’s. I see the same prosecution clerk who worked on the Blake trial, but I can’t remember his name. From my understanding, back then, he was still in law school. I wonder if he’s passed his boards by now. I see Phil milling around at break, and I’m trying to look at the swveral tall, attractive bottle-blonde women near the defense side, and which one is Phil’s wife. The bodyguards are sitting against the back wall, in chairs right beside the entrance to court. Who are all these women? Are they staff of the attorneys? Are they girlfriends of Phil's wife? I ask Russ to point out which one is Phil's wife. The gentleman who is seated to my right points her out. Rachelle Short has her highlighted brown/blondish hair pulled to the back of her head with a cascade of curls falling down to her upper back/shoulder blade area. Break is over, and we are back on the record. The Prosecution brings up an issue before Baden continues her arguments. The images up on the overhead Elmo, are two of the photos that Dr. Henry Lee took. Since the prosecution just got those images on Friday, the prosecution doesn’t want them introduced to the jury until the discovery violation issue is resolved. The defense argues that, they are eventually going to come in, so...(what’s the harm?) Jackson struggles for a rebuttal argument, saying something to the effect that he can’t believe this is what they are using for an argument ... and the judge smiles when he replies, “I hear these kinds of arguments all the time,” and rules in Jackson’s favor. The photos are taken down. Baden continues her opening statement. It’s more detailed science on intra oral gunshot wounds. She puts up a photo of a book by the distinguished Werner Spitz. Baden makes a conclusion regarding part of Jackson’s opening statement (describing where Phil was standing, as close as Lana’s slip). She says, “That way to determine distance is wrong.” Baden goes into great length and detail to show that there is a tremendous amount of spatter material on “the decedent” but virtually very little on Phil. Consequently, he had to be much farther away. It’s now that I have the thought that this woman reminds me a tiny bit of Leslie Abramson (spelling). She puts up an image of blood splatter on Phil’s right side jacket, and goes into detail where evidence was not found. None on his (shirt) cuff. And here is where she makes the startling argument (to me) that, “The absence of evidence is absence of proof of guilt.” “Phil has no tissue on him.” It’s here that the thought goes through my mind about Phil’s wife. I wonder about a woman who marries a man charged with murder, and still has to face that charge. I notice alternates taking notes and a couple, are resting their hands on their head and/or chins. Baden: “No GSR on his shirt. None on his clothes.” The judge takes off his glasses and leans to the side with his right hand fingers holding the temple of his glasses. He appears (to me) to be fiddling with his glasses. He finally sets them down and folds his hands in front of him. A few of the jurors appear to fidget, but no one appears sleepy or yawning. They still seem alert. Baden mentions the name of a famous forensic dentist, called an orodontist (spelling?) who worked on the Ted Bundy case (How is that relevant?). Baden says, “Because the teeth are on the stairs (it shows) no one stood in front of her.” It’s here that she talks about how Phil’s DNA was not found on the bullets inside the gun. LE only found Lana’s and some other person’s DNA. There’ is an image up on the screen, of a gun with the round chamber area pulled away to show the six bullets in their chambers. She talks about the “trace” DNA that was found on this area of the bullets, and that it was not Phil’s. If accurate, this to me is a huge point that the prosecution will have to address. Baden mentions the “blood on ‘diaper’ cloth' was clotted. “Phil had a lot of diapers in the house. They were used for different things.” Huh? I think who uses diapers? These must be a cloth type diaper and obviously not a disposable one. I finally notice that the location of the clock is on the wall directly behind me. As I’m watching this defense attorney deliver these compelling statements, I have a terrible, catty, judgmental thought about her. Why do older women who have dark hair think they can be more attractive as a blonde? And when they do go blonde, why do they get these terrible dye jobs? Like I said, it was a pretty catty thought. When Baden tells the judge that she does have a bit more statement, the judge decides they would break now (it’s right an noon), and start up again after lunch. It’s always a mad rush to the very slow elevators. There are only four elevators that service the 1-11th floors, and they are slow as molasses. Since I will be bringing my lunch, I know I’m going to eat in the building cafeteria. It’s convenient, and it will easier to get back to court on time. Steve tells me that we need to be back at 1:15pm sharp. No later. He also asks me if I know how the coffee is in the cafeteria. I tell him that I don’t drink coffee, so I wouldn’t know. In the cafeteria, I choose a table right next to where Dominick sits. An officer at the table across from me, engages Mr. Dunne with a few questions, and another woman comes up to him to talk to him. He’s very polite and gracious. Always talking to everyone who approaches him. When I finish my lunch, it’s 12:50 pm and I go back upstairs to wait for the courtroom to open again. While I’m waiting, a sheriff comes out in the hallway and says in a loud voice to everyone, “Watch your comments!” Jurors file out behind him, and another sheriff brings up the rear. There are only three reporters in the hallway waiting for court to restart. One is typing up her story on her laptop, the other two are making notes like I am on notepads. The woman asks us about Werner Spitz, “Is he a pathologist? And, who was the gunshot expert? DiMiao?” “Yes,” I say. The reporters talk about the per diem they get from their employers, and listening in, I wonder about that; which news agencies are more generous with these types of benefits than others. I’m also guessing it just depends on what type of contract negotiations they went through when they were hired. Another reporter I had spoken to briefly before lunch joined us in the hallway. This time, I introduced myself and found out she is Dawna Kaufman, and she works for American Media. She is a very nice woman, who has a very positive energy about her. I ask her, who are all these tall, bottle-blonde women associated with the defense? She laughs and says, I know! Who are they? I tell her my real name and that I had attended the Blake trial. Most everyone asks if I’m in law school, and I tell them, no, I’ve just a public person, who’s had a fascination with true crime ever since my late teens. 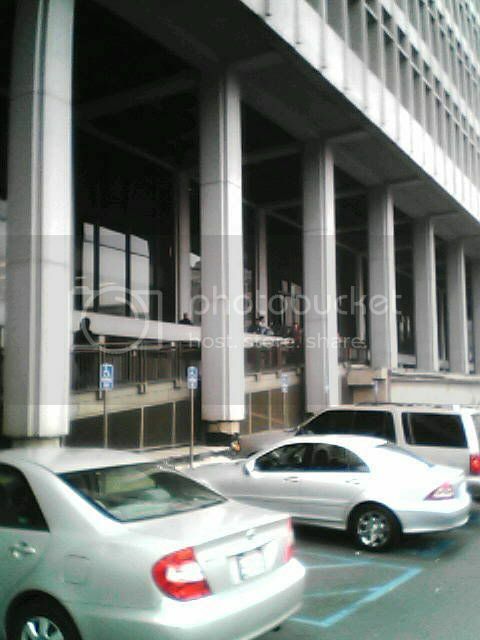 I mention that I was down here for one of the pretrial hearings, and wrote about that on several of the crime forums. She says to me, “You must be Sprocket. You’re famous.” I was completely startled by that statement, because I'm thinking, Huh? NOT famous by any stretch, lol! Dawna and I talk about our viewpoints on the JonBenet case, and I found her perspective interesting, given the fact that she is a reporter. I ask Dawna how she felt Linda Kenney Baden was doing, and she felt that she is doing very well. She felt the issue of the trace DNA on the bullet cartridges would need to be addressed by the prosecution, and I think she's right. Dawna mentions to a few nearby reporters the fact that the attorneys (and reporters) kept referring to Lana as 41 years old. Dawna says she looked it up. Lana was two months shy of her 41st birthday; she was really 40 when she died. Several of the reporters discuss this, because they were all under the impression that she was 41. A sharply dressed reporter walks up to me and Dawna and introduces himself to me, but he says his name so quickly that I don’t catch it; just that he works for “Fox.” I don’t know if that’s our local Fox channel, or Fox News. The Fox reporter talks about the show “24” (he's a big fan) and American Idol, and what a “disgrace” that telethon show they aired was, and how shocking it was that the contestant Jordan got such a low vote turnout. I agree. I was quite disappointed in the whole hype surrounding it and how they used this show to drum up donations to this charity they developed. Finally, the courtroom opens up, we all file in. The prosecution is ready to proceed with their first witness, but they can’t locate her. It’s around 1:50pm, and I position myself to get a good view of the witness box. The witness is still not here. The first witness is Dorothy Melvin, but she has to sit on the witness stand for a bit while the attorneys approach the bench and discuss an issue. I see the Court TV camera zoom in on Phil, and I can see one attorney has his arm around Phil, and he stays like that for a bit. Pat Dixon then takes the podium to question the prosecution’s first witness. Dorothy Melvin is asked about when she first met Phil Spector, and the details surround those events. She first met Phil she said in the early 90’s. She wouldn’t be pinned down more specifically than that. At the time, she was Joan River’s manager; a job she held for approximately 20 years. She said the time span that she started dating Phil lasted about two years. When asked how often they went out, she said that was difficult to answer. The testimony quickly gets to the July 4th weekend of 1993. She talks about flying from New York to Los Angeles, and first visiting her parents. She then drove to Phil’s home at the time, 1210 Arroyo, in Pasadena. She had to call him a few times on her car phone on how to get there. She had never been to his Pasadena home before. She arrived somewhere between 8 and 10 pm. Later during cross she said it was somewhere between 9 and 10 pm. She said, "He showed me around (the house) ots of beautiful things to see...him playing the piano....(he was) drinking from a round bottle with a handle....we talked....he talked...I talked......He drank virtually a full bottle down.” She said they went to the second floor and shot some pool. At some point in the evening he disappeared. But that wasn’t unusual; Phil often did that. She sat down on the sofa and fell asleep, and then sometime early on in the next morning (just before light) she woke up. The prosecution asked about her clothing and what she was wearing. She was wearing a short black dress with a fuscia jacket. When she woke up, she called out for Phil but he didn’t answer. She found him outside, and he was pointing a gun at her mercedes. Dixon: What type of gun was it? Dixon: He was pointing the gun right at you? DM: Yes. In a loud threatening voice, he started screaming at me to get the F back into the house......and take my clothes off. Every time Dorothy talks about what the police officer’s say, the defense jumps up and objects. The judge, every time allowed her to comment, but reminded the jurors that what the witness says the officers said is hearsay. Rosen then objects to another statement in a very aggressive manner and the Judge admonishes him on that. He tells Rosen that there is no need for that in this courtroom. Dixon needs a moment to confer with Jackson, and I see Dominick get up to leave the courtroom. I bet the sheriffs let him back in. Dixon asks a few more questions about the times that Dorothy saw Phil after that event, and she made it clear that she was never alone with Phil after that incident. The prosecution said they were finished with this witness and the Judge called for a break at 2:45pm. I really did need to stretch my legs. I get to see Phil standing up in the defense area. He’s wearing a long black suit jacket and has a white (appears to be silk) kerchief folded into his lapel pocket. His bodyguards surround him. He stays in the courtroom talking to his wife and one of the bottle-blondes. They are all talking very low, leaning in to whisper to each other. I sit down outside the courtroom by the Fox reporter I met earlier. I apologize to him, that I didn’t catch his name. He says his name is Bob Massey (spelling?). As Phil walks by, he smiles at Mr. Massey and says hello. His wife is holding his arm, like he is being led. Bob speculates that Cutler will handle the cross of this witness. He feels the judge is very sharp and knows his rules of evidence. Mr. Massey and I talk about watching people, their expressions, body language and what that reveals about them. As a 19 year bodyworker, this is something I’m very familiar with. I mention that there are a couple of scientists who have broken facial expressions down to miniscule, individual muscles, involuntary muscles that we can’t control, and what they reveal about a person’s emotions. We talk about what it must be like for Phil's wife to sit there, and listen to this testimony.... what must be going through her mind. Bob said he watched her for a bit while Dorothy was testifying, and she appeared fidgety. He noticed she was sitting on her hands. I mention that I find it interesting that, this much younger, beautiful woman married a man who had a charge of murder hanging over him. Bob asks me what news agency I’m with, and I tell him that I’m not with any organization; I’m just a public person following this trial. And Bob responds with something that I’ve heard several times today when I say who I am, “Good for you.” These reporters have been a little surprised but definitely encouraging to me in my effort to attend this trial. I mention to Bob that I attended about 90% of the Blake criminal trial. Bob mentioned that he observed the preliminary trial in that case. (I missed it.) Tom Messerau is a good friend of his. Bob felt that Messerau won that trial for him because he got so much thrown out and dismissed during the prelim. We then talk about our opinions on what we felt really happened to Bonnie Lee Blakely, and if Robert was the shooter. Break is over, and we head back into court. Finally, at 3:05 pm, Rosen stands up to cross this witness. Rosen asks Dorothy, “How do you like to be addressed? Miss, Ms, Miz?” Rosen puts back up the photograph that the prosecution introduced of a smiling Dorothy and Phil taken at a party. Rosen asks Dorothy about the ribbon in the photo on Phil’s lapel. Dorothy says, that ribbon represents the loss of his son when his boy was 9 years old. Rosen asks another question, and Dorothy answers it not as he wanted, and Rosen is very forceful with her and says, “That’s not what I asked you!” The Judge immediately admonishes Rosen: “We are not going to have those type of questions between attorney’s and witnesses." I thought that was interesting. The Judge really rules his courtroom, and won’t let these attorney’s get away with badgering witnesses. Rosen goes over her testimony in detail, wanting to find out who she discussed her testimony with and when she first talked about this incident. Rosen appears to be getting agitated with the witness, and in the next statement, asks about, “...when you were injured.” Dorothy replies, “I was assaulted.” Good for her! Rosen questions her, “You’re absolutely certain about pointing out these injuries on your head and bumps and contusions to the police?” Dorothy replies, “Yes. Two bumps and a small cut.” Dorothy then describes what she calls “...going into Phil mode...” explaining that was when he was screaming. Then he would instantly switch to “charming” for a moment then go back to being a lunatic. Rosen: Did you slam a door in his face? Rosen: Did you push him? Rosen: You stayed in contact with him? DM: He stayed in contact with me. The defense wants to put up on the overhead elmo projection some emails, but the prosecution has a concern with the jury seeing the e-mail address and the attorneys approach the bench. The Judge rules that the e-mail address be blocked out on the e-mails that are put up on the elmo, and given to the jury. Rosen then goes over some correspondence. He puts up on the screen several post cards that Phil wrote to her. Rosen tried to make a big deal of the fact that she still had them. She replied that they were in with a lot of other correspondence that she kept. Rosen put up on the screen an e-mail from Phil from 2002. The e-mail is addressed to “Dorothy and Toto,” something that the witness admitted Phil used to tease her about. I note that the e-mail is signed, “Phil, aka The Prince of Darkness" in a very gothic style type of font. Rosen: He sent you postcards after the incident, Correct? Prosecution objects again to the defense exhibits, and I believe this is where the Judge has the defense block out the address on the postcards, so they will not be visible. Looking over at the jury, I think they look as tired as I feel. It’s very close to 4pm. Sitting still on a hard bench in the gallery with just a thin pad does get to your low back after hours on end. Rosen is still going over more postcards, with the witness that appear to be humorous. He’s bringing this out to stress Phil’s “charming” side. Rosen gets the witness to admit that Phil is “very funny, and talented,” and she agrees. Rosen: You didn’t know Lana Clarkson? Rosen: You were not at the residence (on the night Lana died). DM: No, I was not. Rosen: You attended his parties, yes? Rosen: You did not bring a civil suit against him? Rosen: He never fired a weapon? DM. No, he did not. Rosen: Never had you hold a hand gun? n: Never put the gun in your mouth?DM: No. Rosen: You were not given the weapons to examine? (The gun he pointed at her and the shotgun.) You can’t tell the jury that those weapons were loaded? DM: No, I can not. When you deal with guns, you assume they are loaded. Rosen: Did he ever threaten to sue? Rosen: Did he ever sue? Dixon: Did you ever respond to those cards? DM: They did not require one. Dixon: Were you ever alone with him afterwards? Rosen brings up the fact that on January 23, 2003, you sent him an e-mail requesting all e-mails be rerouted to a new address? There is cross talk over the attorneys, while Dorothy is answering, explaining that it was a global e-mail that went out to all the e-mail addresses she had on her computer. The Judge says, “Stop, stop, stop,” and Dorothy finally stops talking. Judge: Did you still have his e-mail in your computer? Rosen brings up another e-mail she sent Phil, and he reads it to her. It’s an e-mail with an off color joke about a cardiologist, a gynecologist and a proctologist in it. The Judge says, (to Rosen) “In retrospect, maybe you should have had the witness read the e-mail.” There’s laughter in the courtroom. Rosen: I thought the jury would enjoy it. Dorothy says she doesn’t remember the e-mail she sent, or even get the joke. Judge: I’m not going to comment or explain the punch line. Small amount of laughter erupts in the courtroom. The gallery is getting very restless. Well, at least I am. It is after 4pm and I’m ready to move already. I check the clock. It’s 4:10pm, and the attorneys are still going, trying to get the witness released and not have to call back, which is why the Judge continued court past 4pm. Rosen: Were the postcards still in your possession? DM: It wasn’t that long ago and it was with all other mail from other people. DM: I never was out of contact. Dorothy goes onto say that the contact was ended when two detectives (called on her). DM: No. I ended contact on my own. Both the defense and the prosecution say they have no more questions of this witness, and the jury is excused for the day. The court goes back on the record. This was really interesting. Jackson brings up an issue with the court. He says, that the defense opened doors--to witness knowing/experiencing prior bad acts. Jackson says, “This falls in line with the Tizano (spelling?) incident." (I realize this is an event that has been ruled as inadmissible!) “The prosecutions test is cross corroborating. She KNEW his history of (pulling) guns.” (Dorothy witnessed this earlier prior event where Phil went ballistic at a party thrown by Joan Rivers and was, from what I'm gathering, escorted off the premises and/or arrested.) Jackson makes a great argument, that he can bring her back to ask her if she knew of any other incidents....because the defense led the jury to believe that she had never seen Phil like this before, that this was her first experience with Phil pulling out a gun. But it wasn’t. So! This could mean other evidence previously ruled out could be ruled in. The Judge says he will give it some thought. He says he might let in a question to the witness, just a simple, did she know of any other (incidents). Then the Judge goes onto say that Mr. Dixon was responsible for explaining the joke to Ms. Melvin. On the Red Line home, I have the opportunity to observe several of my fellow passengers. There’s quite a diverse collection of faces and souls. I’m happy to be on my way home, while at the same time, I’m trying to see how I can arrange my schedule next week to attend as much of the trial as possible. I was lazy this morning and in the evening. I took the escalator verses climbing or taking the stairs down. I hope to do better in the future, like I had promised myself in February. I hope you enjoyed my trial notes. Please understand that my notes should not be used in place of a more exact transcript of the trial. Although I tried to be as accurate as possible when I was quoting someone, I’m sure you will find some statements that do not exactly match Court TV’s Extra coverage.